Sometimes, it may so happen that an employee has to resign from the organization they have been working in, and the reasons for resignation are more or less numerous in number. But, resigning from an organization is no immediate action, since the firm needs to prepare and record the resignation of the employee and remove their name from the payroll of the firm. 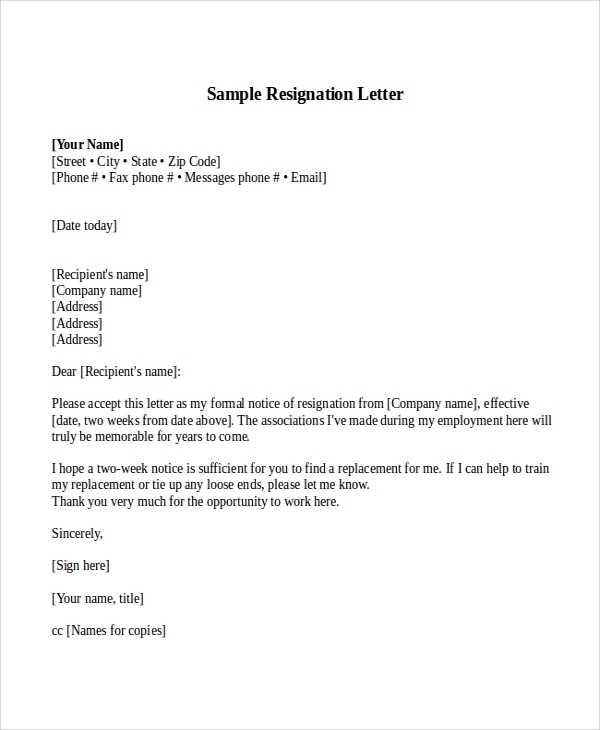 The following list outlines the various kinds of Resignation Letter Sample templates. When an employee chooses to resign from their position of work, they do so after providing a Resignation Letter a fortnight before the actual resignation, stating the reasons for resigning from work. A letter of resignation is the formal way to declare that an employee wishes to associate themselves no longer with the firm they are currently working in. 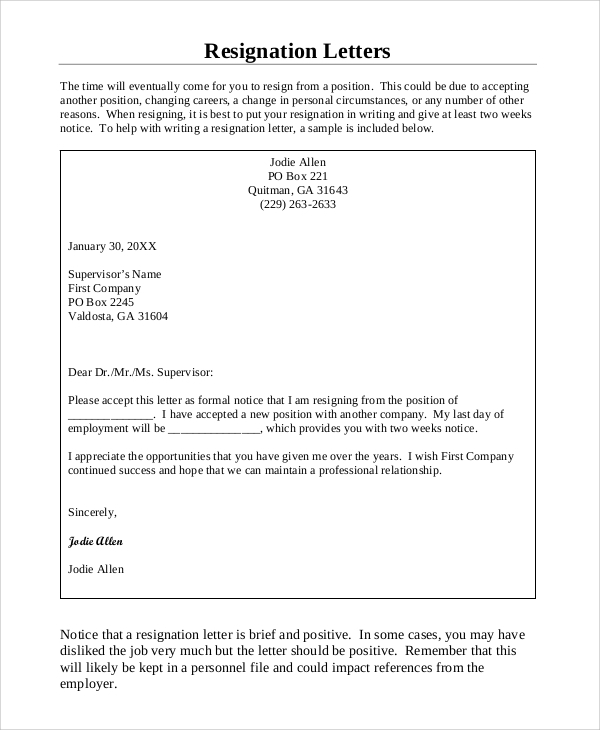 A Letter of Resignation should be of sufficient length, stating the employee’s desire to resign from work and the reasons for which they wish to leave the organization while resigning. Resignation letters with a two-week notice are useful for employees who want to resign from their allotted position and want to express the reasons as to why they are resigning and leaving the organization. The number and nature of reasons could widely vary, and it may include dissatisfaction, discontent or unhealthy working conditions or a breach of the employment agreement on the part of the firm. Thus, resignation letters help to express the feelings of the resigning employee correctly, and it allows the organization to investigate any lapses in their policies. Thus, resignation letters help to express the feelings of the resigning employee correctly, and it allows the organization to investigate any lapses in their policies. 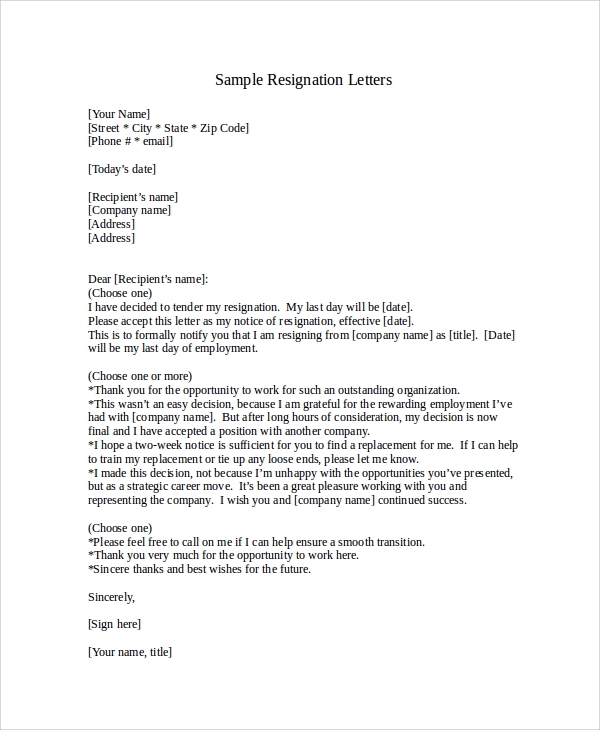 Resignation Letters may help to make termination agreements. A resignation letter should certainly not fail to mention the particular reasons for which an employee has decided to resign from their position in the enterprise. The resume should contain the resigning employee’s clear intention to resign from the position, and it should state their reasons for resigning from their position by addressing their immediate superiors. 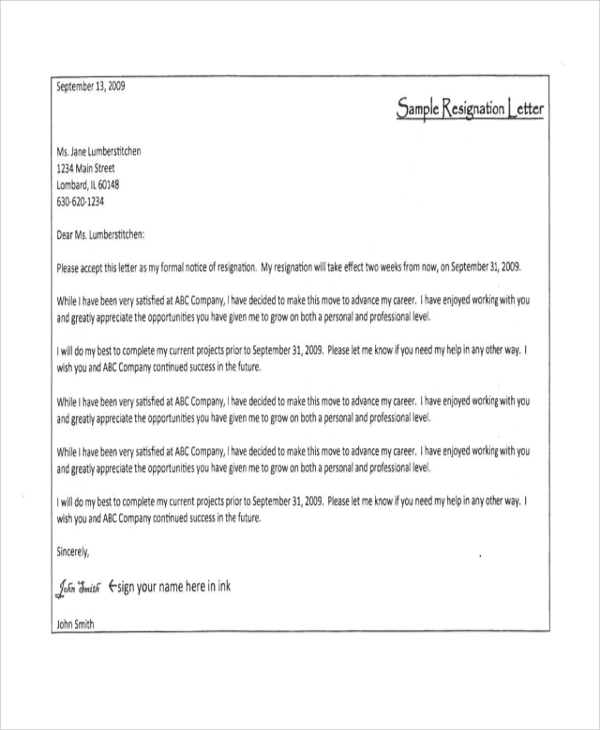 The Sample Letters are aimed towards employees who are planning or have already decided to resign from their employment in the organization. Knowing how to compose a good resignation letter is an important art since it will not only allow you to state why you are resigning but also it will enable the management actually to investigate the causes for which the employee has resigned. 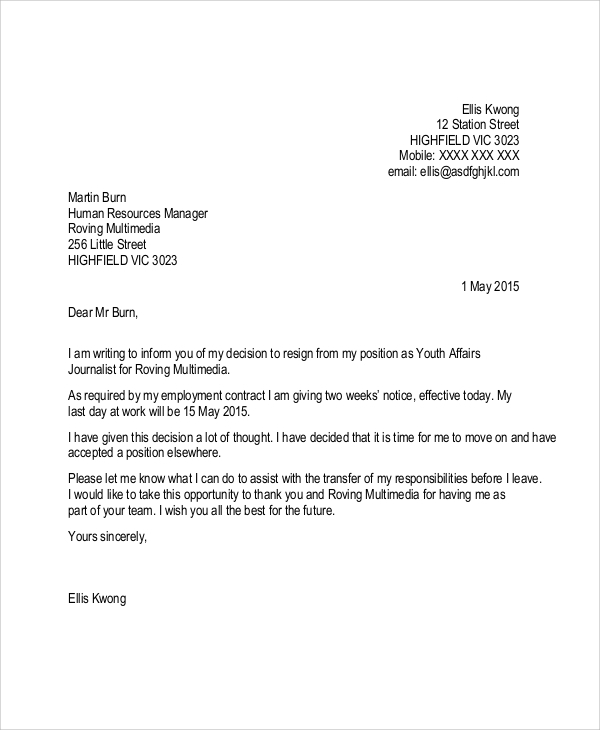 A good resignation letter serves as a wakeup call for the employer to review its policies and the effect that it has on the morale and working condition of its employees. Therefore, good resignations are necessary. So if you plan to resign, we have a large number of Sample Resignation Letters in our collection. Being editable, you may edit and insert any information to suit your purpose. 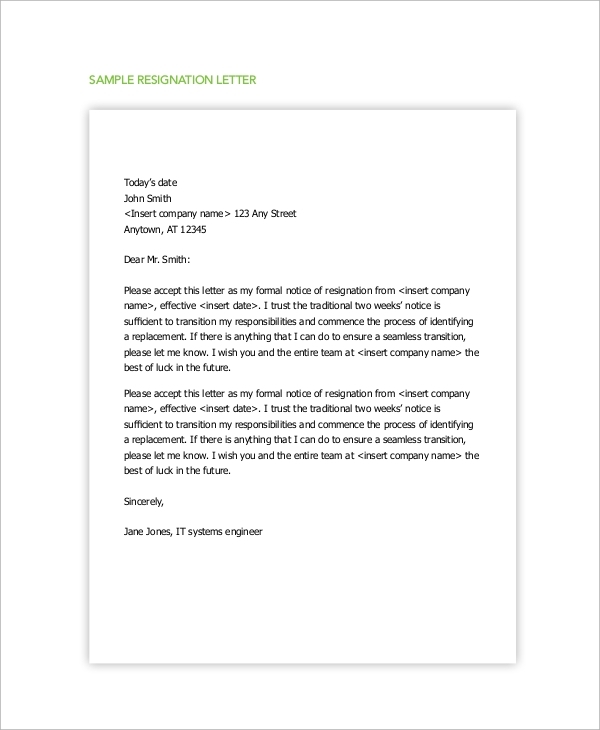 But its originality is your forte; you may utilize our templates as a reference guide for writing your letter.